This female Baltimore Oriole (Icterus galbula) is sitting on a tree branch beside the nest she is building in Presqu’ile Provincial Park, Ontario. 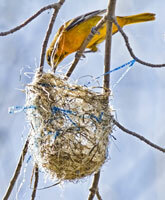 Orioles weave intricate hanging pocket-shaped nests out of long strips of dried plant fibres and bark. This nest even includes a strip of colorful blue plastic. 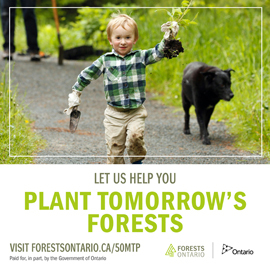 The nests are easier to see in the early spring before there are too many leaves on the trees. 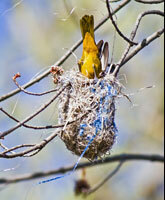 The female oriole flies out and away to collect more plant fibres to continue building her nest. Nests are built near the ends of hanging branches high off the ground. She arrives back at the nest clutching another long plant strip in her beak to weave into the nest. She has to make many trips to collect enough material to create a strong nest. She weaves the fibres around small branches to anchor the nest firmly to the tree. The blue plastic strip provides a sturdy attachment to a tree branch. 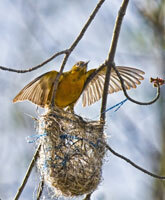 The oriole dives head-first into the nest to work from the inside. 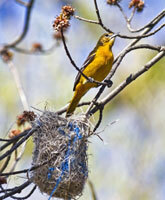 It usually takes about a week of hard work for the oriole to complete the nest. Here she’s wrapping a fibre around a twig that is one of the anchor points for the nest. She carefully threads a fibre around the twig and pulls it tight. Even though she only has her beak to work with, she is able to knit a very complex nest. She drops lower into the nest and pokes her head through the side so she can knit more fibres together with her beak. This strengthens the sides of the nest. She moves around inside the nest to shape it into a pocket deep and wide enough for three to five eggs. The eggs are a pale white or blue color with brown or black spots and she sits on them for about two weeks until the chicks hatch. She lines the bottom with soft materials like hair, wool or small bits of grass to make it more comfortable for the chicks. 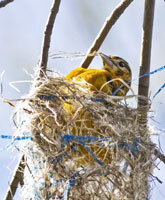 Do spotted orioles build similar type nests? A pair now visits my backyard 2-3 times a day to feed on the bush with the orange flowers and use the bird bath. I feel so fortunate to get these visitors! Any conflict between them and ruby throated humming birds I usually get later in the fall around November? Florida seems to get some spot-breasted orioles, but Ontario does not yet have this introduced species. 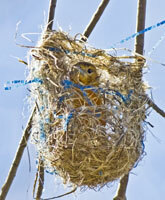 However, both the spot-breasted and Baltimore orioles seem to build similar nests. 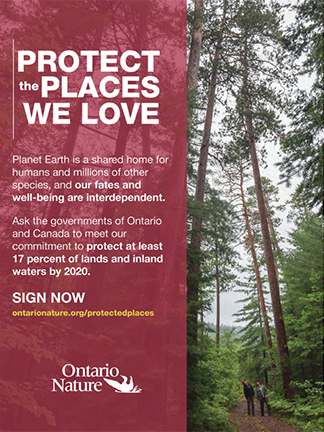 Ontario also has orchard orioles.